This medication is a hypnotic and sedative, prescribed for anxiety, and sleep disorders. Etilaam tablets are thienobenzodizepine medications which contain Etizolam. Etizolam tablets (Etilaam) acts as an anxiolytic, sedative-hypnotic, and antidepressant. 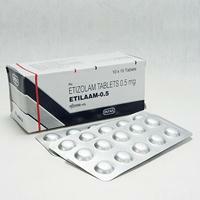 Etilaam tablets are prescribed as oral therapy for the treatment of anxiety disorders such as panic attacks or generalized anxiety and depression in adult patients. Etilaam tablets (Generic Etizolam) are useful for the short-term treatment of insomnia. Etilaam tablets act as anti-convulsant which relaxes the body’s skeletal muscles, thereby treating various medical conditions. Etilaam tablets are selective and have a high affinity for the alpha2 subunit of the postsynaptic GABA receptor.